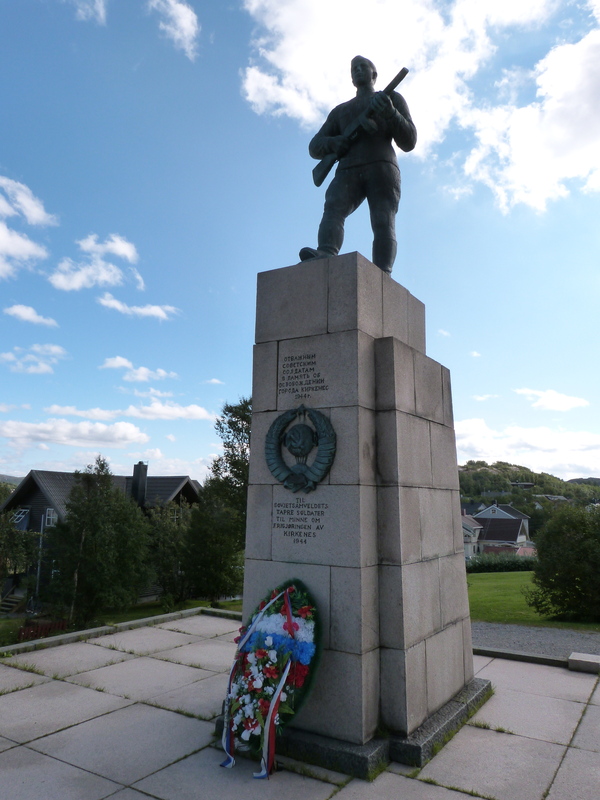 The monument to the Russian liberators of Kirkenes. Communist sympathies caused no end of problems for people here after the liberation. Armed police will seal off the streets of Kirkenes this weekend for the commemorations of the 70th anniversary of the liberation of the town by the Red Army. On Friday a private jet will bring in the Russian Foreign Minister Sergei Lavrov and his Norwegian counterpart Børge Brende who will be taken to the Thon Hotel for VIP receptions. King Harald of Norway will fly in Saturday with the Norwegian Prime Minister Erna Solberg. Police from across the northern counties will be bussed in to provide security for the visit both in the town centre itself and 10kms away at the iron ore mine at Bjornevatn, where 3,000 people from Kirkenes sought refuge from the constant bombing of the town in the final stages of the war. Much of the town was reduced to rubble in a severe air attack in July 1944 and many people fled to avoid the Red Army assault which freed the town in October. On Liberation Day itself, Saturday October 25th, King Harald will speak at a wreath laying ceremony at the war monument in the central square in Kirkenes. There is much speculation about what the King might say. At lunch time attention switches to the iron ore mine at Bjornevatn where there will be a procession and ceremony at the Liberation Monument with a marching band from the local school and cultural events. Here, with King Harald in attendance, the Norwegian Prime Minister Erna Solberg and Russian Foreign Minister Sergei Lavrov will make speeches. After the playing of the Russian and Norwegian national anthems, the VIP guests will return to the Thon Hotel for a reception and evening Liberation Concert. This entry was posted in 20th Century, Arctic Circle, Finnmark, Hammerfest, kirkenes, Nazi, Norway, Scorched Earth, Second World War, Soviet Union, WW2 and tagged 1940s, 20th century, arctic circle, Bjornevatn, Erna Solberg, Finnmark, Finnmark reindeer hammerfest kirkenes honningsvag nordkapp norway scorched earth, German, King Harald, Kirkenes, Liberation, Norway, Red Army, scorched earth stories nazi finnmark travel grant norway 1944 kirkenes hammerfest tromso, Sergei Lavrov, Thon Hotel, Wideroe Airlines. Bookmark the permalink.